This story appeared in the October 27, 2014, issue of Sports Illustrated. Subscribe to the magazine here. With an 82-game schedule, NBA teams travel a lot. This season the Trail Blazers will lead the league with nearly 60,000 miles on the road, followed by the Lakers (55,000) and the Heat (53,000). All that flying means frequent time-zone changes, which can make it difficult for players to perform at peak levels. But jet lag is about more than having trouble sleeping. “It also results from feeding the body when it isn’t expecting it, or vice versa,” says Dr. Chris Winter, a sleep specialist who currently works with the Thunder, as well as the NHL’s Rangers and MLB’s Giants, on proper sleep techniques. Thus, when you eat is a key part of curing jet lag. An athlete trying to quickly acclimate to a new locale can time meals to trick his body into thinking he’s still at home, Winter says. What a player eats is also important. Lakers diet doctor Cate Shanahan makes sure players eat the same food they would at home. To accommodate an airline’s culinary limitations, she opts for meals that keep well and reheat easily—like braised meats such as barbecued baby back ribs instead of steak. “The fats and the exclusion of most carbs help to get rid of blood-sugar fluctuations that keep people awake,” says Shanahan. Ellis also whips up a mean dessert: Greek yogurt topping a mixture of unflavored gelatin, tart cherry juice, a vitamin drink mix and a protein powder that contains alpha-lactalbumin (a natural compound found in milk). The concoction contains sleep-inducing melatonin and tryptophan, and slow digesting proteins for a good night’s rest and overnight muscle repair. “Hydration is also very important because airplanes are very dry, low-pressure environments,” Ellis says. “During the flight we continue to hydrate, but we want to promote as much uninterrupted sleep as possible.” Who wouldn’t drink to that? 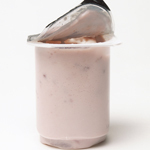 Rich in calcium, yogurt can increase the production of melatonin to aid sleep—and the protein is an added bonus. 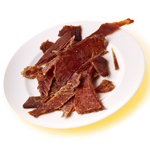 The flat sticks travel well and provide a savory source of protein, which can help you get some zzz’s. 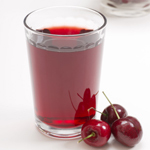 A small serving of this deep-red liquid is a natural source of melatonin and high in antioxidants. 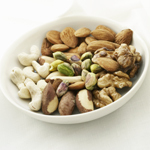 Regular consumption of nuts and seeds may aid sleep because the polyunsaturated fats they contain can boost serotonin.